The falls have been receding upstream through the Batoka Gorges, eroding the sandstone-filled cracks to form the gorges, over the last 100,000 years or so. The basalt, through which the Zambezi runs for 209 km’s in the Livingstone area is characterised by very marked joints or cracks, which may have developed as the molten lava cooled. One dominant series of joints running in an east-west direction is associated with zones of soft material within the basalt. Since the Zambezi is flowing due south in the Livingstone area, these softer materials are very easily eroded to form the great east-west gorges. Upstream retreat of the Falls is due to a second major series of joints running north-south. Gradual erosion of small joints that run north-south caused the river to be concentrated into a narrow fissure and the broad fall line was abandoned. Once this happened, it was only a question of time before the narrow gorges cut back into another transverse fracture zone of soft material. This gouging out of the soft zone again established a broad fall. This process has been repeated over many years and the zigzag gorges represent seven previous lines of waterfalls. 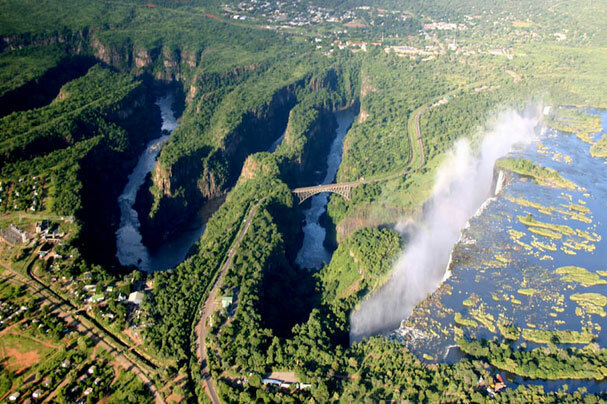 Read more about the facts of Victoria Falls.